Now you can own your own models of Medway Queen in the popular 1/1250 ship collector scale. Ideal for dioramas or display in a cabinet. The models are nicely proportioned and about 1 3/4 inches long.These models have been made by Mountford and are marketed by MT Miniatures Ltd. 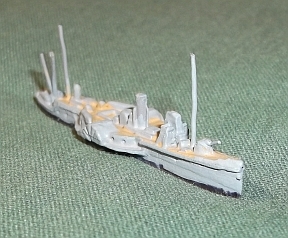 The model is available in two forms: the excursion steamer (right) and HMS Medway Queen (below). Unlike the previous model from Mountford this one is not a kit. Each comes fully assembled and painted at a really affordable price. 1/1250 models are difficult to photograph and these pictures do not do the model justice. 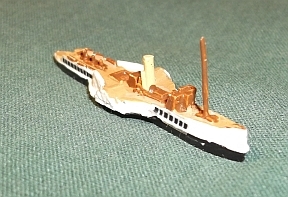 ​Small off-cuts of original Medway Queen decking are also available as a base for the models, price £7.